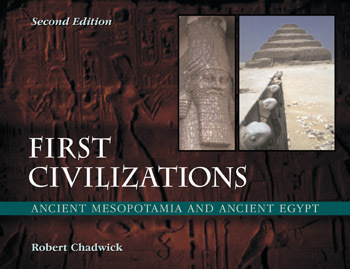 First Civilizations is the second edition of a popular student text first published in 1996 in Montreal by Les Editions Champ Fleury. This much updated and expanded edition provides an introductory overview of the civilizations of ancient Mesopotamia and ancient Egypt. It was conceived primarily for students who have little or no knowledge of ancient history or archaeology. The book begins with the role of history and archaeology in understanding the past, and continues with the origins of agriculture and the formation of the Sumerian city-states in Mesopotamia. Three subsequent chapters concentrate on Assyrian and Babylonian history and culture. The second half of the book focuses on Egypt, begining with the physical environment of the Nile, the formation of the Egyptian state and the Old Kingdom. Subsequent chapters discuss the Middle Kingdom, the Hyksos period,and the 18th Dynasty, with space devoted to Hatshepsut, Akhenaten, the Ramesside period. The text ends with the Persian conquest of Mesopotamia and Egypt. First Civilizations also contains sections on astronomy, medicine, architecture, eschatology, religion, burial practices and mummification, and discusses the myths of Gilgamesh, Isis and Osiris. Each chapter has a basic bibliography which emphasizes English language encyclopedias, books and journals specializing in the ancient Near East. The author is successful in his goal to provide an in-depth coverage of Ancient Near Eastern history for the beginning student....Chadwick skillfully brings to life the long-forgotten details of these two great civilizations. Chadwick's writing is lucid and flowing and, with such a profusion of illustrative material, the reader's attention is easily commanded. ...This is an excellent publication available at a modest price and I would encourage everyone to purchase a copy.